I had this conversation with a distiller the other day and I was surprised (and perhaps ignorant / stuck in a bubble / etc…) that what I thought was “common knowledge” is, in fact, not. Do whisky and spirit drinkers really understand the difference between Cask Strength & Bottle Strength whiskies? Furthermore, do they know what to do with a cask strength whisky? This distiller thinks that people still need to be educated on the matter. I, however, think that consumers know the difference and know how to enjoy them. Perhaps I am wrong … what do you think? Just to clear up any confusion, doubt or appease any general curiousities, I’ve outlined the key points that I think are important to know about this high-powered spirit. Fellow bloggers & whisky enthusiasts, I invite you to chime in, please. 1) WHAT: Cask Strength is the whisky straight from the cask. No water added. Typically in the 55%-60% abv range (double those numbers to know the proof) vs. the more common 40%-45% abv of most bottled whiskies. 2) WHY: Bottling whiskies at Cask Strength is typically reserved for the upper premium whiskies. This is more expensive for both the producer and the consumer because the product is more concentrated and the distiller get’s fewer number of bottles to sell out of a single cask. 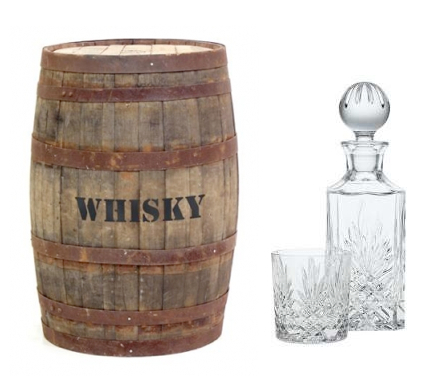 You, the consumer, get more whisky (same volume, but more actual whisky). 3) BENEFIT: What’s great about having a cask strength whisky is that you then get to take over and play “blender” by controlling the amount of water you add in your glass. 4) HOW TO: Let me repeat myself, you (the consumer) get to add the amount of water you would like instead of having this pre-done by the distiller. If you have the pleasure of tasting a cask strength whisky, make sure you know what to expect. This is going to be much stronger than what you’re used to (unless you make it a habit to drink these, in which case, my hat’s off to you). Essentially, you’re buying whole spices here, not the pre-ground McCormick shaker. Proceed excitedly with educated caution. Cool post. This an increasingly relevant choice of options. I think the other major benefit is that cask strength whiskies are all (maybe there’s the odd exception with barrel proof American whiskeys) non-chill filtered, so there’s an assurance that you’re getting optimal flavour bang for your buck. And on a more subjective level I find that there’s a certain intangible appeal to cask-strength whiskies which is more than the sum of these benefits mentioned – maybe because they’re still quite novel and uncommon, maybe because they’re seen as the “real deal”. Whatever it is I’m on that bus and loving the ride. Thanks! I’m glad you shared your thoughts – you brought up 2 great points. The non-chill filtered is really important. By removing this part of the process, the distillers are leaving in all of those good bits and flavors (drinkers, don’t be worried if your non-chill filtered whiskies look cloudy or have a bit of a white film on top, this is what whisky does naturally when given time & space), just the way the wine industry realized a while ago that “sediment was O.K.” … thank you, purists. I have nothing to add to your second point except that I love your outlook on the subject. You captured a great feeling and I’m with you on that bus! Great post, Im planning on writing a review for my Cask Strength Laphroaig in the nest few days ( one of my all time favourites 🙂 ) If you dont mind i’d like to add a link to this post as I agree that some education is required on what to do with cask strength expressions. 2) Yes, of course! Link away! Way to break it down! My only complaint about Cask Strength… it takes some tinkering to get the right water to Whisk(e)y ratio. That being said, I’ve had quite a few of those powerhouses at full strength and MAN OH MAN do they pack a punch! Fiery and intense for sure, but still a worthwhile experience (you have to try it at full strength at least once). I battled a stupid cold for a couple weeks with a bottle of Booker’s. The Booker’s didn’t kill the cold, but it at least made me forget about it for a little while. And speaking of cask strength American whiskeys, some of those crazy Buffalo Trace Antique Collection cask strength releases and the Parker Heritage Collection releases are ridiculously good! I think you’re very smart to use a bottle of Booker’s while battling a cold! If nothing else, it’ll keep you warm! The Buffalo Trace Antique Collection is ahh-mazing. I did a tasting not too long ago of the George T. Stagg, Sazerac Rye 18yr, & the William Larue Weller bourbon. I nearly died I was so happy. They were delicious and exactly what bourbons & ryes should taste like. Gold standard for sure. Thanks for bringing them up! Thanks for the education! Valuable info for a newbie like me. Any suggestions on a few cask strength to try to get my feet wet? I’ve been rolling this question around in my brain these last few days. Most cask strength whiskies are on the pricer side so I hesitate to recommend a “newbie” as you called yourself to go out spend lots of $ on something you may or may not like. One of the most approachable (and, luckily, more affordable) cask-strength whiskies is True Blue corn whisky by Balcones (http://www.balconesdistilling.com/). This might be a good place to start if you’re set on buying a bottle to add to your growing collection. Otherwise, I would say track down your favorite bar tender at your favorite whisky bar and see what they have waiting for you behind the bar! Something to keep in mind is that cask strength can encompass a large number range. Very old single malts tend to be closer to the minimum 40% abv and are bottled at cask strength because any additional aging will drop the ABV to below the legal minimum of 40%. If you aren’t sure a whisk(e)y is cask strength, a good rule of thumb is seeing if the ABV or proof has a decimal point (i.e. the value is not a whole number). That’s a great tip, Eric! Glad you added that here. Thanks for joining in on the conversation! You are currently reading “Cask Strength” vs. Bottle Strength at The Whisky Woman.